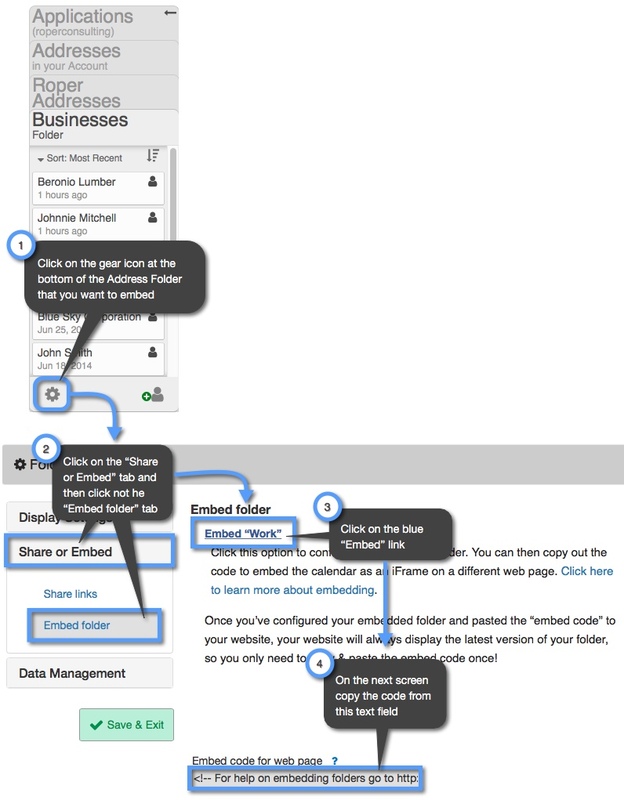 You can create several folders in Keep&Share that will hold different groups addresses. This is can be an extremely helpful feature when it comes to organizing your addresses, like separating business addresses from personal addresses. When you embed this code into your website, it will look almost exactly like how your folder of addresses appears when you are looking at it on your Keep&Share account. Note: You can click on each single address and navigate to all of the information regarding that address. Follow the directions below to find the embedding code for your folder of addresses. Notice that there is a width and height listed for the iframe in the embed code. By default, the width of the iframe is always “900” and the height is “700.” However, you can change these measurements to anything you choose so that it will fit whatever web page you’re embedding the folder in. Frameborder – you can change this number to give a border to your iframe. Scrolling – you can change this to “yes” to add scrollbars to your folder of addresses if your information goes outside of the size of the iframe.